In Love’s Labour’s Lost, the King of Navarre and his three schoolmates are ripe for an education in love from the Princess of France and her three ladies. Joining the lovers is a brilliantly goofy troupe of clowns, including the love-warrior Don Armado and the lust-sick rogue Costard, who ardently pursue the affections of a winsome country maid — and who perform an unforgettable pageant for the royals. Written around the same time as Romeo and Juliet and A Midsummer Night’s Dream, this giddy and extravagant romantic comedy is Shakespeare’s most exuberant wordfest — a joyful carnival of love, loss, and hope. 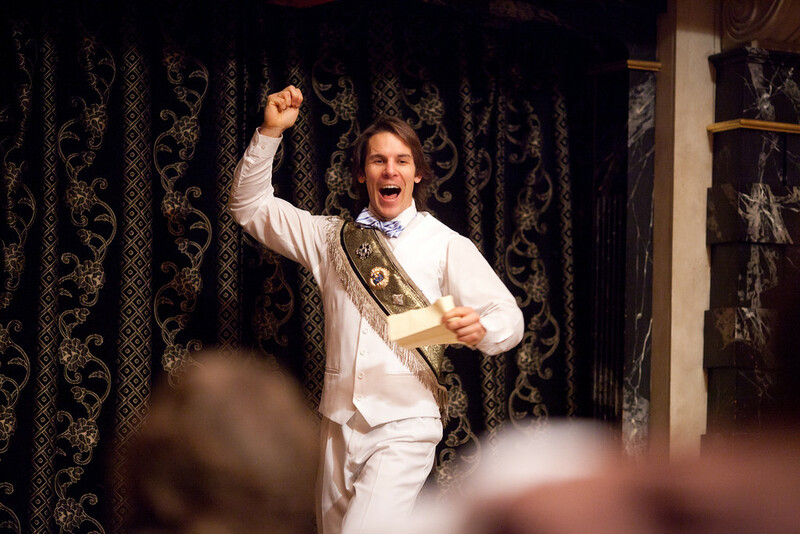 Patrick Midgley in LOVE'S LABOUR'S LOST. Photo by LAUREN D. ROGERS. 2013. 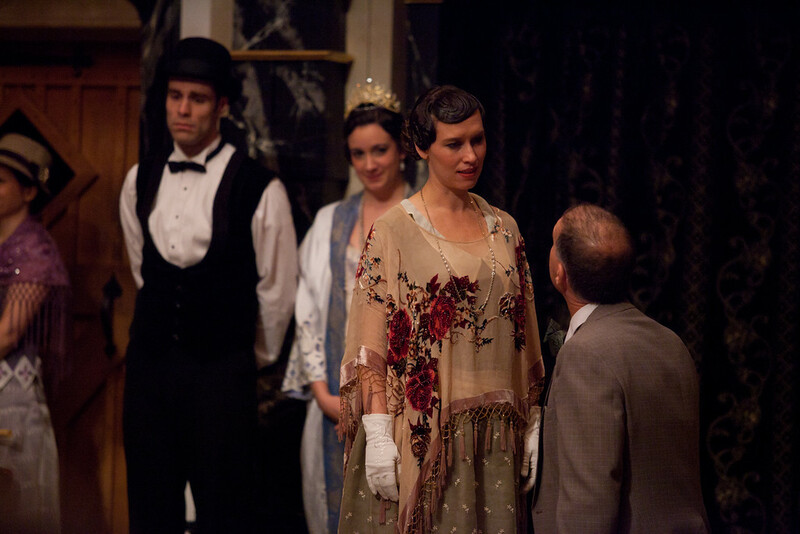 Lexie Helgerson and David Millstone in LOVE'S LABOUR'S LOST. Photo by LAUREN D. ROGERS. 2013. 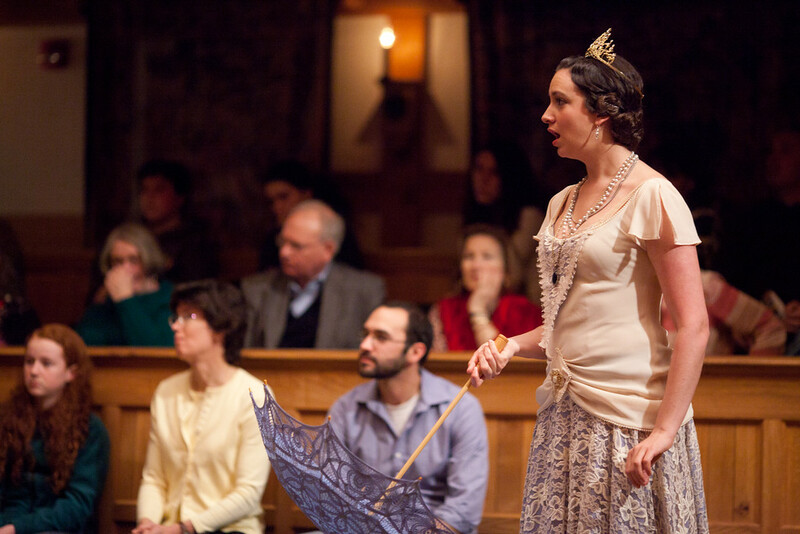 Stephanie Holladay Earl in LOVE'S LABOUR'S LOST. Photo by LAUREN D. ROGERS. 2013. 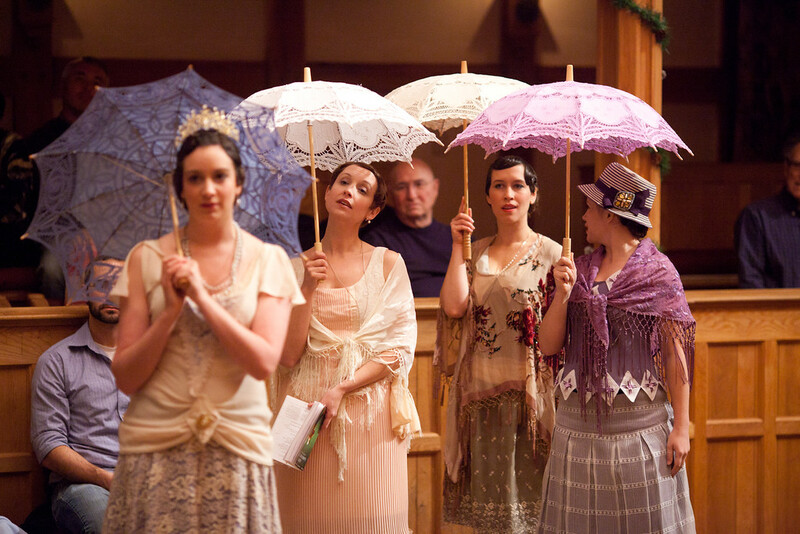 Stephanie Holladay Earl, Molly Gilman, Bridget Rue, and Lexie Helgerson in LOVE'S LABOUR'S LOST. Photo by LAUREN D. ROGERS. 2013. 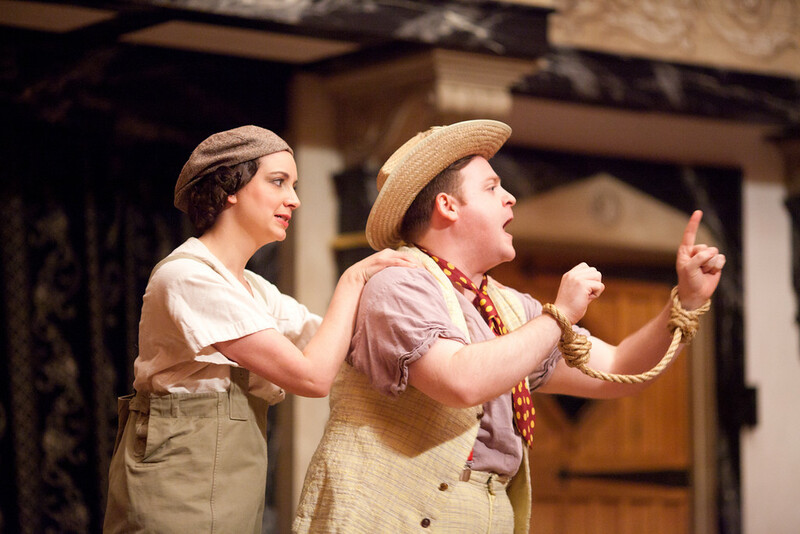 Stephanie Holladay Earl and Andrew Goldwasser in LOVE'S LABOUR'S LOST. Photo by LAUREN D. ROGERS. 2013. 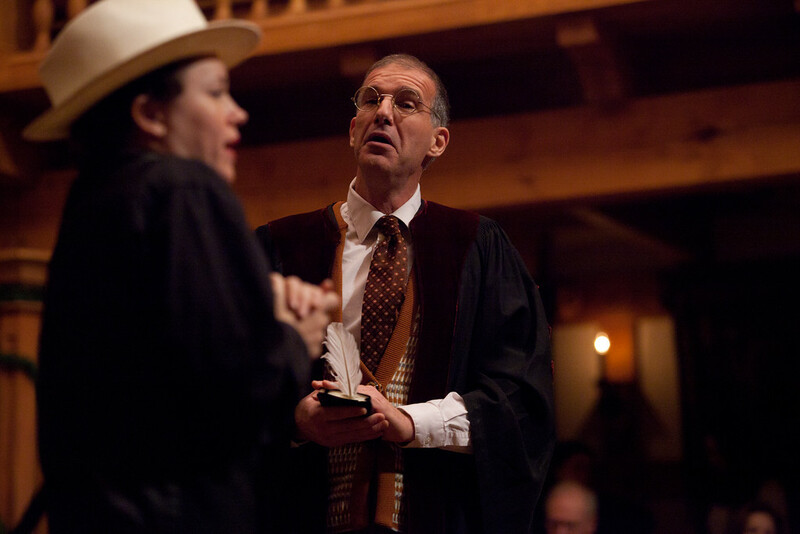 Rick Blunt in LOVE'S LABOUR'S LOST. Photo by LAUREN D. ROGERS. 2013. Bridget Rue, David Millstone, and the cast of LOVE'S LABOUR'S LOST. Photo by LAUREN D. ROGERS. 2013. 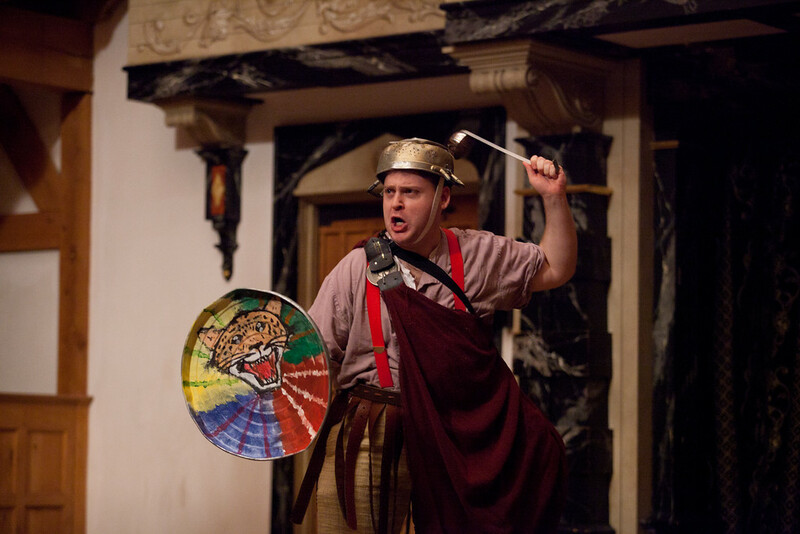 Andrew Goldwasser in LOVE'S LABOUR'S LOST. Photo by LAUREN D. ROGERS. 2013. The King of Navarre and lords Longaville, Dumaine, and Berowne vow to study for three years, swearing off women for that period. The impending diplomatic visit of the Princess of France, however, threatens the King’s “no girls allowed” proclamation. Costard, a country swain, has been found with Jaquenetta and arrested for breaking the new statute. For his offense, the King puts Costard in the custody of the Spaniard Don Armado, who is in love with Jaquenetta. The Princess of France arrives, accompanied by her ladies, Maria, Katherine, and Rosaline. She sends her man Boyet to discover if they will be admitted to the King’s court, but the King courteously denies them entrance to the court, permitting them to stay in his park instead. After seeing the Princess, however, the King falls instantly in love with her.  Don Armado releases Costard so that he can bear Armado’s love letter to Jaquenetta. Before Costard can accomplish this task, however, Berowne meets Costard and gives him his own letter for Rosaline. Jaquenetta and Costard deliver Berowne’s letter to Rosaline. The King and his lords decide to forget their vows and pursue their beloveds. 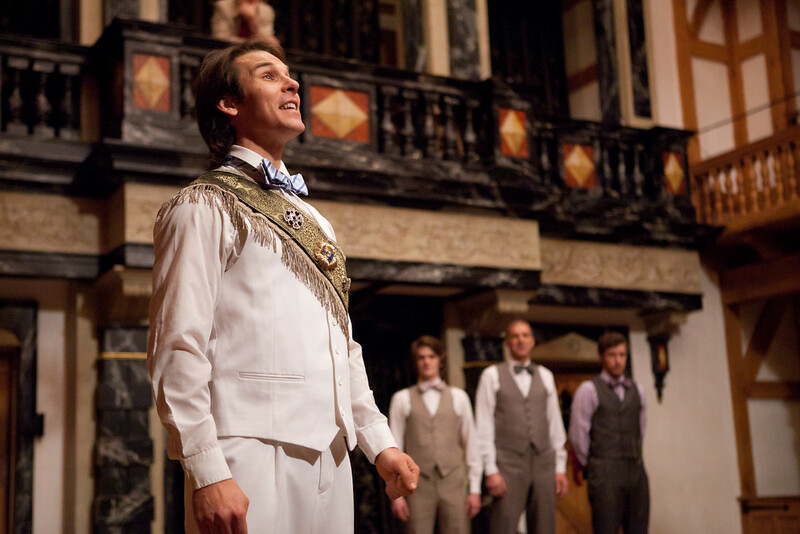 Don Armado reveals to Holofernes, Sir Nathaniel, Dull, Moth, and Costard that, at the King’s request, he is preparing an entertainment for the ladies of France. Disguises, tricks, The Nine Worthies, and the course of true love ensue. 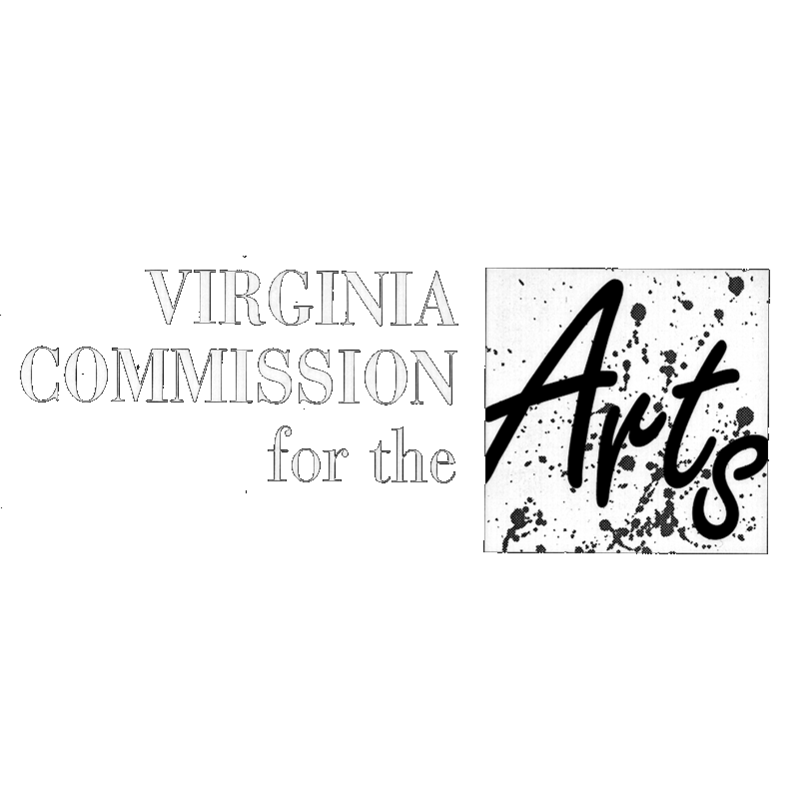 Love’s Labour’s Lost is a great play. Most likely, Shakespeare wrote it in 1594-5-ish, around the same time as these other “lyrical” plays: Richard II, A Midsummer Night’s Dream, and Romeo and Juliet. To put it in context with his other comedies, LLL probably came after The Comedy of Errors, The Two Gentlemen of Verona, The Taming of the Shrew and before Much Ado about Nothing, As You Like It, and Twelfth Night. If you’ve seen or read other Shakespeare plays, you’ll find some familiar characters, situations, and glorious language in LLL. As is the case in The Two Gentlemen of Verona, one clown is not enough in LLL. Berowne and Rosaline’s merry war in LLL paves the way for Benedick and Beatrice in Much Ado. The Prince of Arragon in The Merchant of Venice seems to be related to the Spanish braggart Don Armado in LLL. And the play-within-a-play, The Nine Worthies, at the end of LLL is a precursor to Pyramus and Thisby at the end of Midsummer. While some of these characters and elements may seem familiar, the banquet Shakespeare gives us in LLL is also a singular feast. The “no girls allowed” boys club at the top of LLL appears nowhere else in Shakespeare’s canon (although Bendick wishes he had one in Much Ado). As soon as the King of Navarre and his men dedicate their lives to academic study and to the shunning of women for three years, they learn of the impending arrival of the Princess of France and her women; then they individually/secretly/hypocritically throw away their vows to pursue their loves. Thus Shakespeare immediately gives us FOUR couples to follow on their journeys. On top of that, the clown and the braggart are both interested in a country lass, bringing the total to FIVE (AND A HALF) couples, a number not duplicated by Shakespeare before and after LLL. 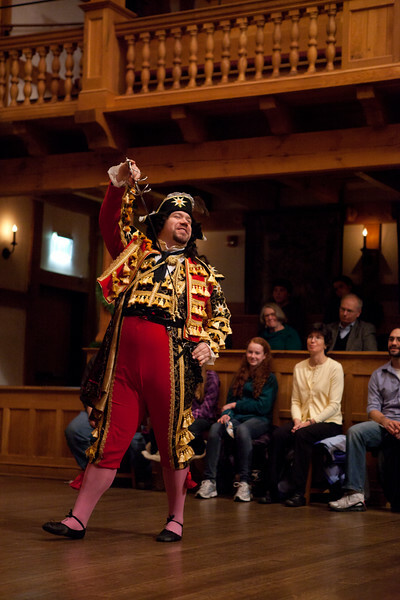 finale of LLL, many scholars speculate that the lost play entitled Love’s Labour’s Won is a sequel to LLL (while others think that LLW is simply an alternate name to one of Shakespeare’s other comedies). Either way, the ending of LLL makes it a unique play. When most scholars, critics, and theatre practitioners discuss LLL, they often mention first the magnificent wordplay that elevates this play to its unique status. The verbal fireworks explode with dazzling debates between the couples, the incandescent colloquy of the academic and comic characters, and the majestic use of verse and prose, rhyming couplets, multiple sonnets, and riveting rhetoric. Shakespeare didn’t write plays in “Old English”; he helped invent, expand, and explore Modern English, the language that we know today. Modern English was young and muscular in Shakespeare’s time and he launches all of the bombast and beauty he could dream up for this brilliant comedy. selves by experiencing these wonderful works as artists and audience. As we are about to start rehearsing this great play, we hope to find all its fun and its soul to share with you.